(RED OAK) – Employees at Texas State Technical College celebrated Employee Appreciation Day in June, a day that included fun for employees and awards for employees of the year. 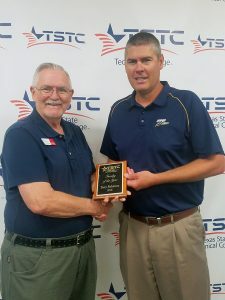 HVAC Instructor Terry Robinson was chosen as faculty member of the year. Robinson, a native of Clute, Texas, who has been teaching at TSTC for two years, said he was humbled to receive the honor from his peers. Robinson was working as a service manager when he discovered a passion for teaching. “That’s the way I try to approach my teaching. I enjoy communicating with my students and being creative,” he said. He enjoys showing students the significance of TSTC. Robinson and his wife, a former elementary school teacher, share a passion for education. This entry was posted in North Texas on July 30, 2018 by Debra Gonzalez.